A highway to ecstacy ! When I was coming back from work, I hardly came across two or three persons in the streets. However, I was not surprised, for such was how the city normally looked like on July and August mid-days. I walked as fast as I could, helplessly trying to escape the tremendous heat. I rushed to my small apartment and was surprisingly able to climb up all those stairs in a few seconds. Once in my apartment, I took a shower, and then started my computer to check my inbox and download some music. To my surprise, I had received an email from my brother whom I haven’t talked to in such a long time, and there was even a song attached to the email! I felt awkward, for my brother had always been reticent when it came to showing his feelings- he always considered music a window to one’s soul and thus refused to say what music he liked or disliked. My mind went wild. It went straight to the days of my early childhood; I remembered those summer mid-days when we used to run home -barefoot- in search of a shadowy place to protect us from the heat. We have always been happy to find the door open, as it saved us from my grandmother’s laments. We used to rush to my grandfather, who was always sitting in his royal place, getting ready to prepare tea. 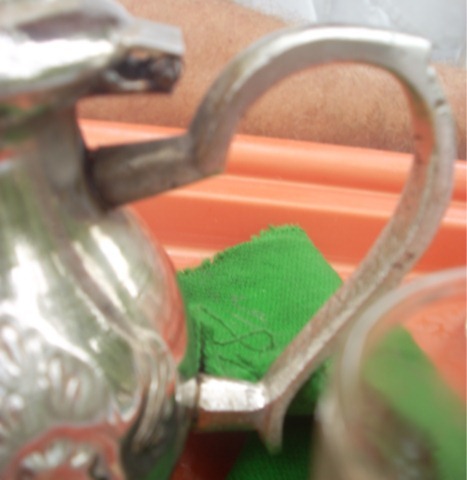 My grandmother used to bring him the famous detachable three-legged silver tray, tea, hard cones of sugar, green and blue colored tea glasses, and the silver tea pot with long curved spout with fresh mint on it. As soon as my grandfather made sure everything was alright, he would ask for the boiling water to clean tea: an action which we’ve always found strange until he explained that it was for the sake of cleaning tea and making it taste less bitter. Then he would add some cones of hard sugar, fill the tea pot with water and put it on fire. When tea was almost ready, he would add the fresh mint and re-put the tea pot on fire for an additional two minutes. Then he amazed us at his skill at pouring tea from a height of half a meter forming a foamy head, he would pour it into the tea pot for a good mix. The smell of tea would overwhelm the place and lessen the acuteness of heat through quenching our thirst; something we failed to do when we-barefoot- run after the ice cream seller. The song was over and I felt as if awakened from a dream which I embraced, and wished those days would come back. I looked for my phone and tried to dial my brother’s number, which I found hard to remember. I felt sad and was reminded of all the times I spent away from him. Suddenly, something vibrated in my hand; it was my brother calling me. I quickly answered. His voice sounded strange, as if he were drawning. We kept silent for a while and then he asked if we could meet in our grandparent’s house in two days. – “Ok, See you then!” I said. a very creative, imaginative and descriptive short story of Moroccan tea. i like the whole story especially the end ( i felt as if you are really going to drink tea with your brother for real not only in dreams.) i like this impression! really good job fadoua. looking forward to reading your writings, keep it up! nice piece of writing… keep it up.. miss u!! !